In the white and wintery woods, a stranger is roaming about. But what is it exactly? 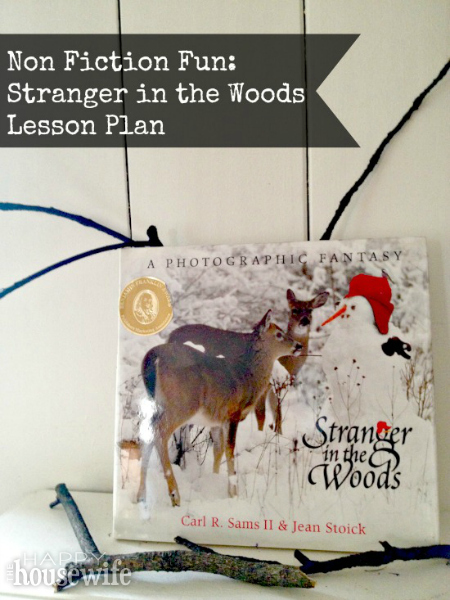 In the book, Stranger in the Woods by Carl Sams and Jean Stoic, children will discover that answer. This book is an excellent piece of literature for children ages pre k-3, and can be an asset when teaching a variety of topics and skills. 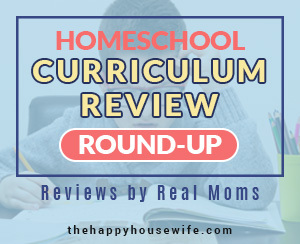 Below, you will find three lesson plans perfect for using in your early childhood home school lessons. 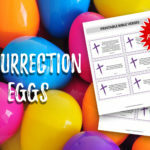 You will use the above mentioned supplies in all of the activities below, so keep them grouped together for easy access as you explore these lessons. You can space these lessons out however you wish, or do them in whichever order you wish. The choice and flexibility is all yours! Objective: Students will be able to have a deeper understanding of the photographic text genre. Directions: For this activity, students will explore the idea of a photographic text, or a photographic fantasy as this text is referred to. The pictures in this text tell a great deal of the story, allowing the children to use inference to decipher what it happening. 1. Begin this activity by reading the story out loud with the children, taking frequent breaks to discuss the text, the pictures, and to answer any questions that may pop up. Take a moment to reflect at the conclusion of the text. 2. Now, focus on how the author used photographs to help tell the story. Ask the children if they have ever told a story through photographs before. Chances are, they haven’t. Now, they get the chance to! Allow each child to use an inexpensive digital camera or disposable camera. Stress that their snapshots they are about to take should be purposeful and tell a story. It may be helpful to brainstorm some story topics prior to exploring your surroundings with the camera. 3. Once some brainstorming is done, move to the outdoors and allow the students to begin taking photographs that they feel will tell their stories. Allow a good hour for this creative process. 4. When you resume, print your photos out on a printer or send them to a one hour photo. In the meantime, you can reflect on the creative process of taking the photos. Did they think this was easier or harder than drawing illustrations? 5. When the photos are done, take 8-10 sheets of construction paper and encourage the children to assemble their photos in a timeline that tells the story they wish to convey. Allow them to add minimal sentences as the author of this story does to help the story. 6. Now it is time to share. Host an author’s club where the children are allowed to take a special seat and share what they created! You can conclude this activity by reviewing what they learned about this unique way of storytelling. Keep their photographic texts out where they can be easily seen and enjoyed. Objective: Students will better understand how sequence in a story works and why it is important. Students will be able to put a story in sequential order. Directions: Sequencing is a huge part of storytelling. Begin this lesson by introducing the word “sequence” and defining it together. Write the word on a piece of paper so students know what it looks like. Ask them where they may have heard this word and why they think it is important. 1. Next, write the animals featured in this story on small slips of paper and put them in a hat. Write one animal per slip. Allow each child to pull a piece of paper from the hat. Keep the book near so they can reference the animal they have been assigned. 2. It will now be their job to draw a picture that depicts this animal. Allow for 30 minutes (more if needed) for the child to draw a picture that depicts the chosen critter. 3. At the end of the creative time, you are now going to gather again and talk about putting these pictures in sequence. It will be like putting a human puzzle together. Allow students to problem solve and work together to line up the animals as they appear in the order of the story. 4. Choose one child to be the snowman. You can even cut a snowman out of paper if you wish for the child to hold. Allow some time for role play where the children approach the snowman on the order that happens in the story. Children will have fun acting out the various reactions of the animals as they see the snowman. 5. At the conclusion of this artistic time and role play, talk again about sequencing. If the animals were mixed up, would the story still work? How would the story be different? Allow time for questions and reflection. Objectives: Students will better understand winter animals and how they adapt to the elements. Students will be able to use adjectives to describe winter animals. Directions: Explore the photos of this book again and point out how active the children and animals in the story are. 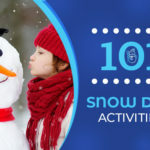 Even when winter sets in, there is still a lot of activity happening! Now it is time to explore that activity. Have a conversation with students about what they see happening in nature during the winter. What animals do they see? How does the climate change? How do the plants and trees change? Discuss. 1. Now, give each child a piece of paper and ask them to pick an animal from the book. Allow them to study the animal carefully. How is the animal built to survive the winter? What physical characteristics do they notice? Have them draw a picture of the animal and make arrows to the attributes that help the animal survive. 2. Next, gather this information each child has collected on a poster board. You can name the board “Winter Animals” and attach each picture or simply write the name. Next to it, write the attributes that each animal has to help it survive (i.e. thicker fur, sharp teeth or claws, heavy foot padding.) Do they see some similarities amongst animals? Discuss. 3. Once the poster board is assembled, talk about how they can help animals survive the winter. Make a list. This can include putting out fresh water and birdseed, or putting fabric scraps in the yard for nests. 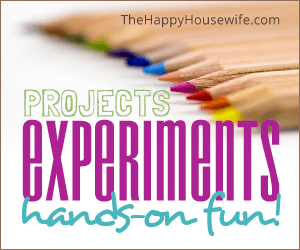 You can even try some of these activities to further the lesson if you wish. 4. At the conclusion, allow time for questions and reflection. As you can see, Stranger in the Woods is a wonderful book full of opportunities to teach a larger lesson. Give these simple lessons a try and see how simple it is to enjoy this book even further!